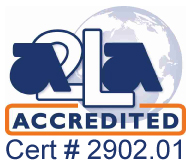 Oxford Lab Products has been producing quality pipettes for more than 20 years. Priding themselves in providing for their customers with the highest level of service and satisfaction, Oxford Lab Products is making a name for itself within the laboratory. With an aesthetic and innovative line of pipettes leading the way, Oxford Lab Products offers a wide variety of laboratory products that fit into any lab. Putting a focus on producing accurate, reliable, and ergonomic products, they bring a new twist to the industry with unique, aesthetic appearances. Dedicated to manufacturing top quality laboratory equipment, Oxford Lab Products is confident in providing long standing warranties on their top of the line products. These warranties can last up to 5 years, further proving Oxford LP’s commitment to quality. Recently, their product offering expanded from mechanical pipettes to include electronic pipettes, centrifuges, vortex mixers, magnetic stirrers, hotplate stirrers, tube rollers and rotators, and shakers incorporating unique features that will benefit scientists. 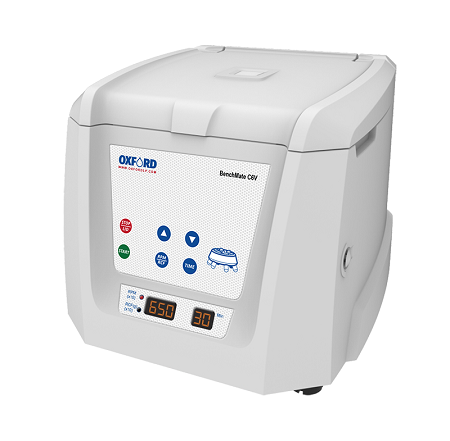 Oxford Lab Products offers a line of Benchmate microcentrifuges that are compact and user friendly. 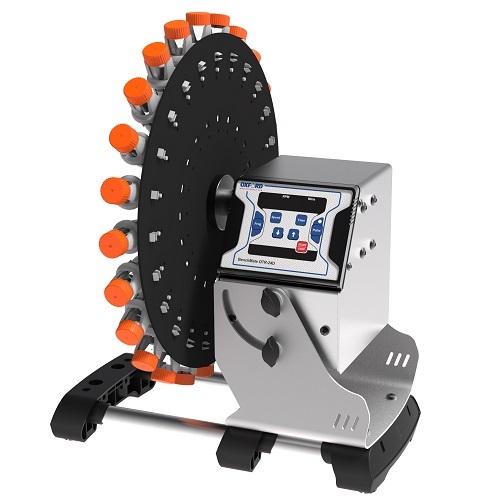 Featuring electronic safety brakes, low noise output, and both fixed and variable speed options, Oxford LP has a unique centrifuge to fit your lab’s needs. Oxford also has a hematocrit centrifuge designed for blood laboratories and separating micro solutions. 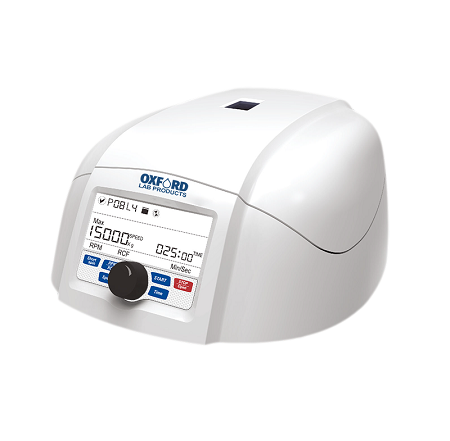 Designed with a small footprint and power in mind, Oxford LP’s vortex mixers can perform powerful vortexing anywhere in the lab. With speeds up to 4,500 rpm, timer capabilities, and mixing modes including continual vortex and pulse, scientists are able to meet any vortex mixing needs. 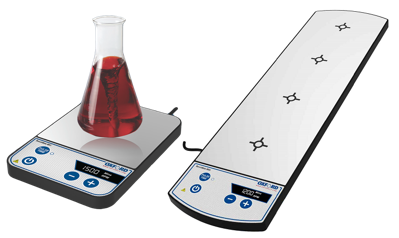 Including both hotplate stirrers and regular magnetic stirrers, Oxford Lab Products offers multiple options of stirrers to satisfy any laboratory application. 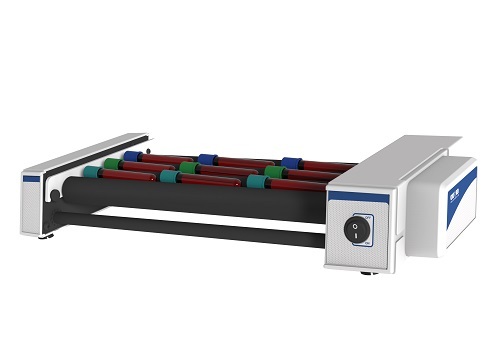 With models including up to 10 stirring positions and pulse mode to enhance mixing, these hotplate stirrers are designed to maximize efficiency while minimizing wasted space. 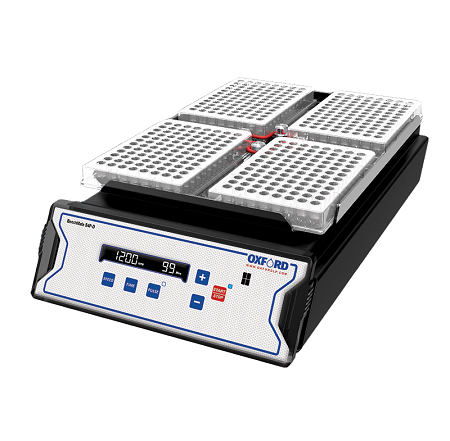 Combining a hotplate and magnetic stirrer into one piece of equipment, Oxford LP has solved many labs issue for the need to heat and mix simultaneously. 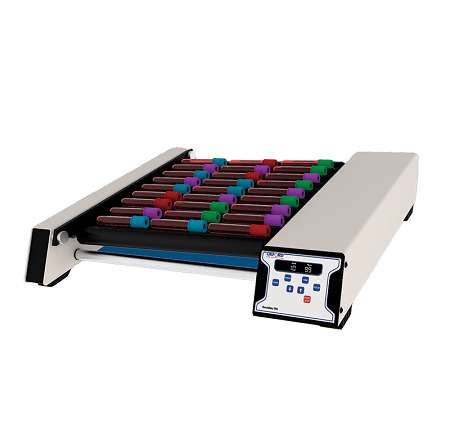 Tube rollers and tube rotators are an essential product in laboratories that require mixing of biological samples. These gentle mixing styles are used to prevent blood coagulation in samples, immunoprecipitation, latex agglutination assays and preparation of homogenous dispersions. Able to run in both cold room and incubated settings, these tube rollers and tube rotators can be utilized in various applications. 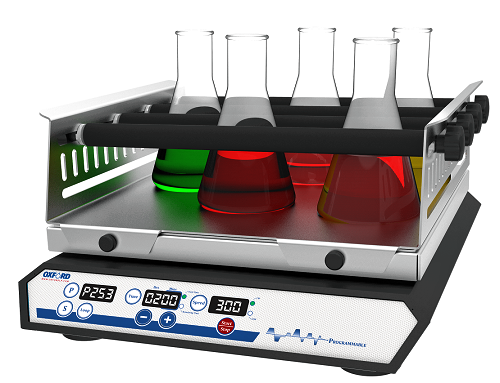 Providing flexibility in the laboratory, Benchmate Plate Shakers from Oxford Lab Products are a great addition for a scientist to have. 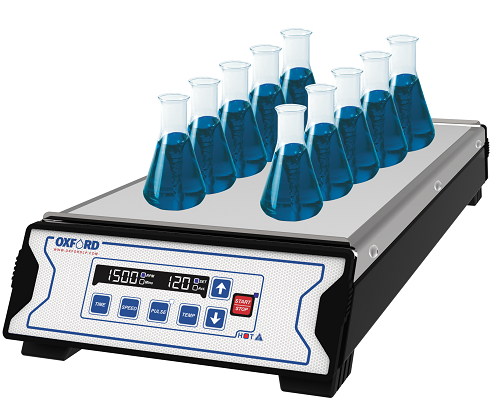 Compatible with plates, beakers, flasks, test tubes, bowls, and many more, Oxford Lab Products’ shakers can be programmed for a variety of mixing times, speeds, and functions. 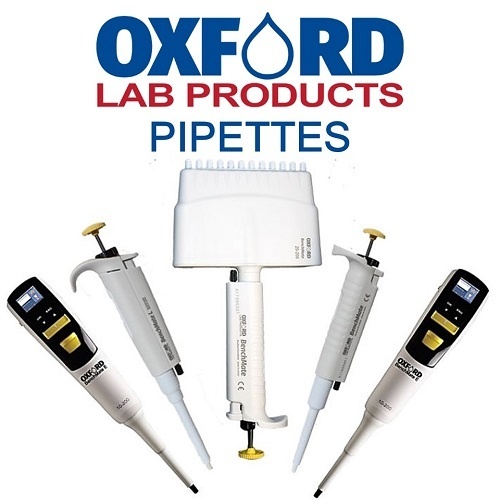 Be sure to check out Oxford Labs Pipettes here! The new wave of micro centrifuges is here! 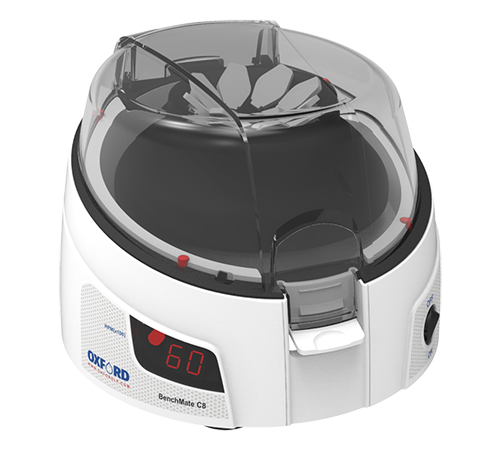 The BenchMate C8 Micro Centrifuge enhances scientists research with user-friendly features, safety-oriented technology, and a robust yet compact design. Provides a variable speed range from 300 to 4200 rpm for gentle to vigorous mixing. Built-in counter balance. Continuous, timed and touch modes with status LED. Timer range from 1 to 999 mins. Optional attachments for vortex mixing microtubes, microplates and flasks. Variable speed range from 200 to 1200 rpm for gentle to vigorous mixing. Variable timer from 1 to 999 minutes, or infinite mode. Rubber o-ring provides a firm and secure grip for holding plates in place. Programmable Pulse mode for vigorous shaking. Compatible with all standard skirted microplates. Digital display (ideal for GLP laboratories). Powerful, high-speed centrifuge. Speed range of 500 to 15000 rpm. Large backlit digital LCD display. Imbalance detector with auto cut-off. USB port for remote terminal control capability. Remote operation with data logging. Quick acceleration and deceleration time. Countdown timer - 30 secs to 999 mins, or infinite mode. Speed setting by rpm/RCF mode. Small and compact in footprint (100 mm x 100 mm) and weight (0.55 kg). Impressive speed range from 2500 to 4500 rpm. Smart and Robust design – press activation with suspension. Built in counter balance and rubber pads for smooth, stable and silent operation. Adjustable speed range between 15 to 1500 rpm (MS1) and between 15 to 1200 rpm (MS4). Variable timer from 1 to 99 minutes, or infinite mode. Real-time digital display of speed and time. Pulse mode for more vigorous stirring requirements. Corrosion-free stainless steel surface. Ideal for blood plasma work. Accommodates most common collection tubes – comes with adapters for smaller 5 mL, 7 mL, 9/10 mL & 1.5/2 mL tubes. Fixed angle rotor. Imbalance detection safety system with auto cut-off. Speed range from 500 to 6500 rpm in steps of 100 rpm. One switch change over from rpm to RCF. Ideal for vortexing or mixing of single to multiple tubes, with a variable speed and digital display for high performance. Featuring an adjustable speed range from 10 to 80 rpm. Removable and autoclavable nylon rollers for quick and easy cleaning. Digital display (ideal for GLP). Save up to 9 programs with the handy user programmable feature. Pulse mode for more vigorous rolling and mixing needs. Can be used in incubators at temperatures up to 40˚C and in cold rooms at temperatures as low as 5˚C. 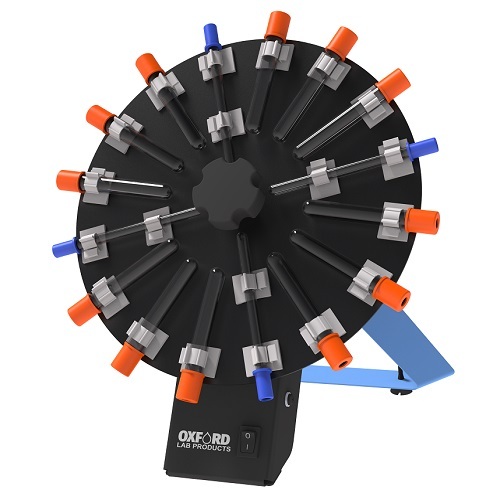 Oxford Lab Products Analog Tube Rotator is an Affordable and Dependable Option for Your Lab. 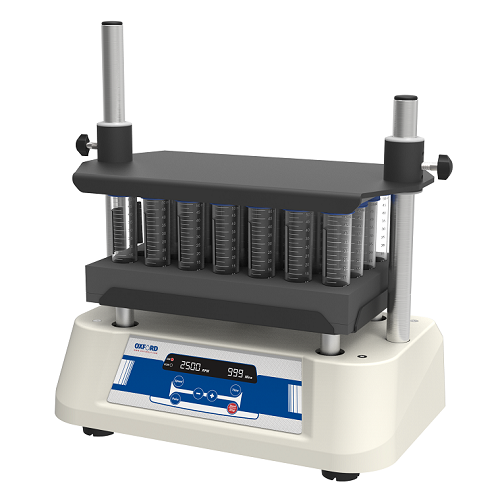 Oxford LP BenchMate Analog Tube Roller Designed for Optimal Mixing of Blood and Viscous or Liquid-Solid Samples. 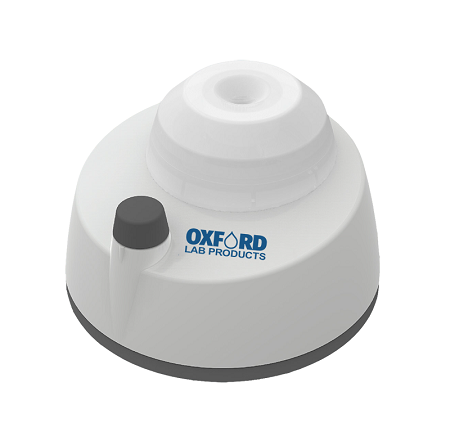 Oxford Lab Products BenchMate Orbital Shakers feature innovative programming to switch between clockwise and counterclockwise motions to mix the most turbid samples. 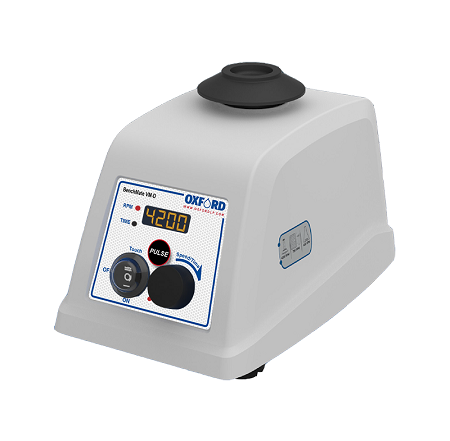 Oxford Lab Products BenchMate Orbital Shakers can mix up to a total of 7.5 Kg. Oxford Lab Products Centrifuge Tubes have been designed by scientists to meet all the needs required of centrifuge tubes in today's laboratories, combining the key features in one premium product - sterile, max centrifugation speed up to 20,000 x g, and free from DNase, RNase, human DNA, endotoxins, pyrogens, PCR inhibitors, lubricants, and heavy metals.